The media was treated to a biodiesel plant tour today at Direct Fuels Biodiesel in Euless, TX. It was a very comprehensive tour that included the facilities and learning about their process and even how they test for quality. 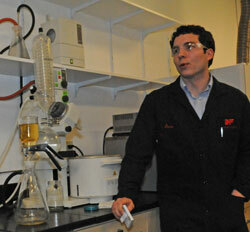 Jacob McClernon, Quality Assurance Specialist is pictured showing us their cold soak filtration test. We also heard from Mark Farrer, Director Biodiesel Operations. He gave us a very thorough description of their process and I recorded a portion of it for you to listen to. There are photos from the tour in our photo album which you can access from the link below.